This cake. I am so excited about it. It has moved up to one of my favorite cakes of all time. Also, I have made it three-times just to get one pretty enough to share with you. I think I did the same thing last week with this pie. What is my deal? Why on earth does it take me three tries to get pretty looking food? Well, technically I only made this exact cake twice, but the very first time I made it was all the way back in August. Yeah, August. The idea was a little different and the cake was a lot more summery than this wintery one, but I still made a version of this cake, photographed it and then decided I hated the photos. So we ate the cake and I came up with a better idea….. But it was an idea best in late November/December idea. So I waited. Finally! I mean, I have waited a good four months to tell you about this cake. 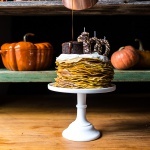 So let’s talk about this crepe cake. It’s filled with the best chocolate mousse. It is filled with coconut cream and rum. It is topped with coconut whipped cream + toasted flaked coconut + coconut rum toasted pecans + coconut rum ganache. And maybe pomegranate arils if you are into them. I actually am not. But I’m not a big fan of chocolate and fruit together. It may look like a ton of work. But really it is not all that hard. You just have to plan ahead. People will freak over this cake and be in total awe and amazement over you. I know the ingredient list might be a bit frightening, and I know the steps seem long, but don’t be scared off. I am not going to tell you it is super easy and will take no time at all because it does take some time and a little patience too, but it is so worth it. 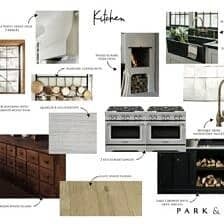 Maybe a fun weekend or holiday project? I recommend breaking up the steps between two days. 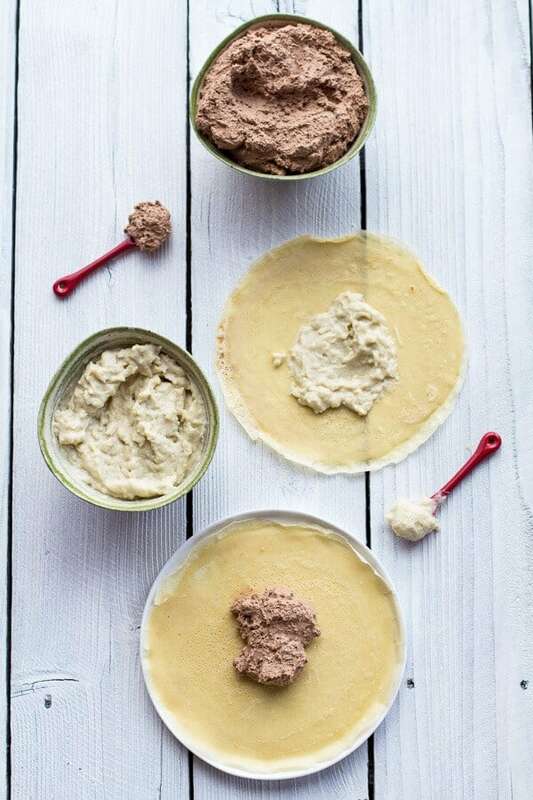 Make the coconut cream, chocolate mouse and crepes one day so they can chill in the fridge overnight. Then all you have to do the next day is layer the crepes and whip some cream. Doesn’t sound so bad right? Seriously, it’s not. I promise that sometime soon I will do a post on how I make my crepes because I know a lot of you are hesitant to make them. Really, you shouldn’t be. 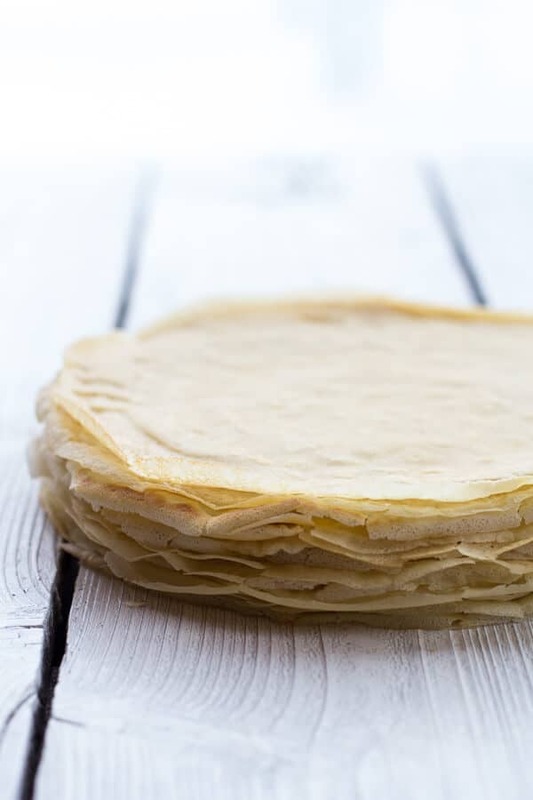 I have to say that I have perfected them and have the whole thing down to a T. They say practice makes perfect and that could not be more true with crepes. I promise, you will see! You may fail horribly the first two or three, but by the fourth you will start to get the hang of it. Ok, and the coconut rum cream. Wow, this stuff is so good and coconuty, but if coconut is not your thing just swap in regular old whipped cream. Maybe add some booze or lots of vanilla extract to make it a little fun. But if coconut IS you thing, man you will die over this stuff. It is so good because it is creamy and thick like pudding, but has such an amazing coconut flavor from the coconut rum and coconut milk. And then there’s the chocolate mousse. Well, this stuff is just my favorite. 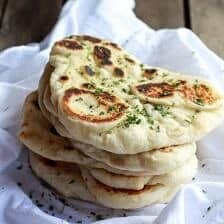 I make it all the time and have changed up the recipe overtime to perfect it. The amount of cream to chocolate is spot on and is the lightest and airiest mousse ever. 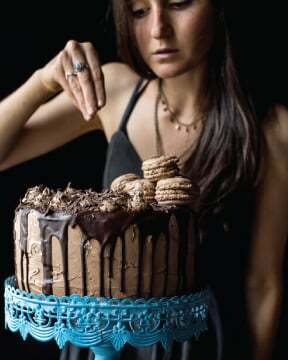 Trust me you guys, you want to make this cake. Don’t be afraid. If you like them, add some pomegranate arils. They makes the cake extra, extra festive. Perfect for any holiday party. Oh, and let me tell you a little secret about making your cake pretty. Thin layers!! Do not make your layers thick and make sure the mouse and coconut cream are evenly spread out among the crepes. The recipe yields just the right amount for 19-20 crepes, but if you end up with only 15 or so because of mess ups don’t worry, just don’t use all the coconut cream and chocolate mouse. 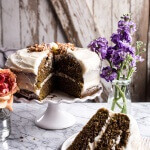 You want nice thin layers so the cake doesn’t want to slide all over the place. If it does slide, don’t cry. Just eat it all tilted over and enjoy its deliciousness. Whether it is perfect, somewhere in the middle or a total mess, it is still going to taste dang GOOD. To make the mousse. In a microwave safe bowl add the chocolate. Microwave on 30 second intervals, stirring after each, until melted and smooth. Stir in the melted butter, it will thicken. Set aside to cool. In a small saucepan whisk together the egg yolks, 2 tablespoons water and sugar. Place on the stove over medium heat and stir constantly until the sauce thickens slightly and just coats the back of a spoon, about 2-3 minutes. Make sure to remove the eggs from the stove the minute they begin to curdle and thicken. Stir the melted chocolate into the egg mixture until completely smooth. Place in the fridge while you whip the cream. Place the cream in the bowl of a stand mixer (or a large bowl using a hand mixer) and whip cream until stiff peaks form. Add the vanilla and coconut rum (if using) and whip until combined. Make sure not to over-beat, cream will then become lumpy and butter-like. Now add half the whipped cream with cooled chocolate mixture. Gently fold the cream into the chocolate until no more streaks remain. Add the remaining cream and gently fold into the mousse. Cover the bowl and place in the fridge for two hours or overnight. To make the coconut rum cream. In a medium saucepan combine the coconut milk and cornstarch. Whisk until the cornstarch is completely dissolved and there are no lumps. Add the sugar, eggs and salt, whisk until smooth. Place the pan on the stove and bring to a boil, stirring constantly. Simmer until the cream thickens and is smooth like pudding, about 5 minutes. Remove from the heat and stir in the vanilla, coconut rum (if using) and shredded coconut. Transfer the cream to a bowl, cover and chill two hours or overnight. To make the crepes. Add butter to a small saucepan and heat over medium heat. Whisk constantly until brown bits appear on the bottom, about 5-6 minutes, then immediately remove from heat and set aside. Combine the eggs, milk, flour, the melted + browned butter, salt, 1 cup water and vanilla in a blender or food processor. Pulse for 30 seconds or until well combined. Place the crepe batter in the refrigerator for about 30 minutes or overnight. This allows the bubbles to subside so the crepes will be less likely to tear during cooking. The batter will keep for up to 48 hours. Remove the batter from the fridge and whisk in the remaining 1/4 cup water. Heat a 10 to 12 inch (I used a 10 inch) non-stick skillet or cast iron skillet over low-medium heat (never go above medium low). Add cooking spray (I think cooking spray works best) to coat. In a circular motion pour 1/4 cup of batter (I measure it out for every single crepe) into the skillet. Quickly pick the skillet up (using an oven mitt, especially if using a cast iron skillet!) and swirl in a circular motion to spread evenly. Cook for 30 seconds and flip. Cook for another 10 seconds and remove to a cutting board. Lay them out flat so they can cool on a piece of parchment paper. After 5 minutes or so I like to flip the crepes to make sure they are not sticking to the parchment. Continue until all batter is gone. Makes 20 crepes. To assemble the cake. Place the bowl of a stand mixer (or a large bowl) and your whisk attachment (or beaters) in the freezer. Lay all 20 crepes (or however many you made, but I think you need at least 15. I had 19) out on a large clean counter. 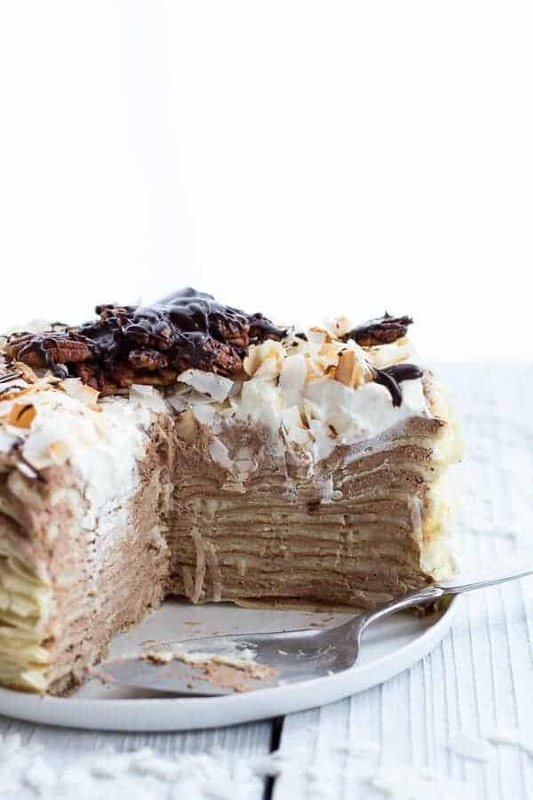 Remove the chocolate mouse and coconut cream from the fridge and evenly divide both the mouse and coconut cream among all 20 crepes (10 with chocolate mousse, 10 with coconut cream) and spread in an even, thin layer. 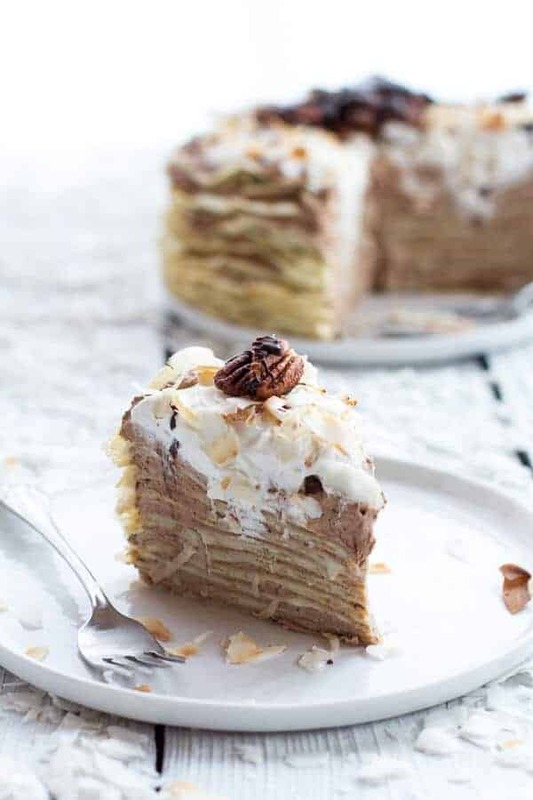 Now place one crepe in the center of your serving plate and layer on the rest alternating between the chocolate mousse and coconut cream (one coconut cream layer, one chocolate mouse layer and so on). Do your best to try and keep the stack straight. 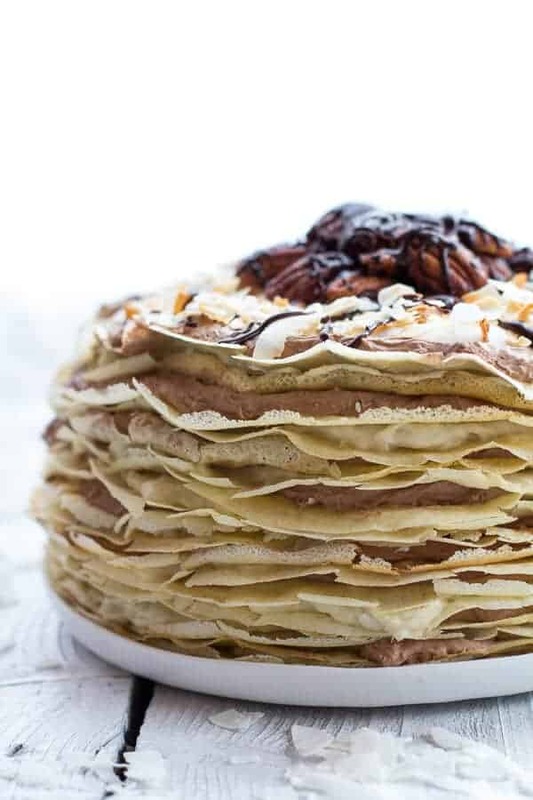 Once you have used all the crepes and the cake is assembled place it in the fridge while you whip the coconut cream. Flip your cold can of coconut milk upside down and open it. There should be around 1/2 cup of coconut water at the top. Pour this into a container and save for another use. Scoop out the coconut cream and place in a bowl. Whip the cream until soft peaks form. It will not be stiff like regular whipped cream Beat in the powdered sugar. Remove the cake from the fridge and top with your desired amount of coconut whipped cream. Place back in the fridge for 30 minutes or until ready to serve. 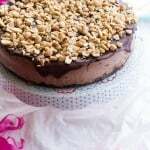 When ready to serve, top the cake with toasted coconut, rum toasted pecans and a drizzle of chocolate ganache (below) if desired. Slice and eat! To make the ganache combine 2 ounces chocolate and 2 tablespoons coconut milk in a small microwave safe bowl. Melt the chocolate in the microwave on 30 second intervals, stirring between each until the chocolate and coconut milk are smooth. Stir in 1 tablespoon coconut rum or vanilla extract. This will make such a festive addition to any holiday table, your guests will forever love you for it! Ahh! This cake! 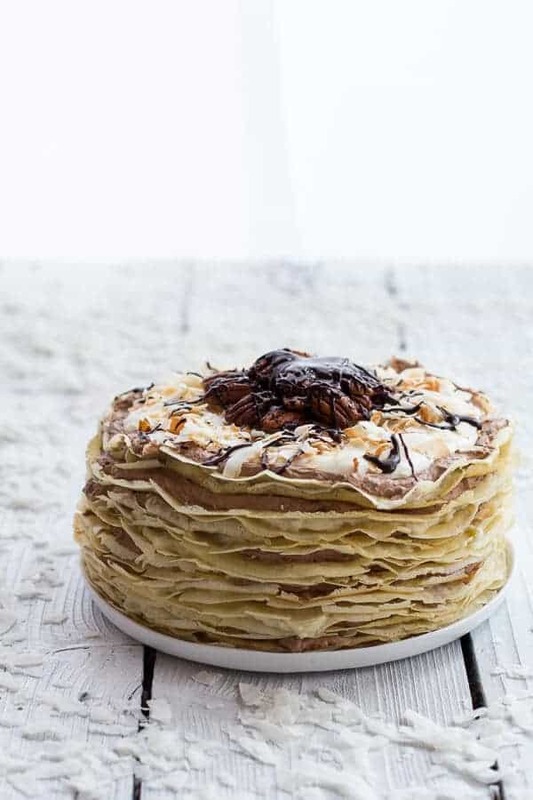 I’m obsessed with the idea of crepe cakes at the moment and this is stuffed with some of my very favourite things in the world! Thank you so much, Kathryn! Crepes are really fun and perfect for the holidays! Tieghan, this crepe cake is epic. It looks and sounds absolutely amazing. It’s definitely a special occasion cake. Pinning because I want to try this. Thanks Norma! Hope you give it a try! Thank you!! I am not sure about who had crepe cakes in their books, I actually and sadly do not have any of those books. But yeah, it is time consuming and I really have no idea what I was thinking trying to make it, since time is precious these day. Meaning I have non. LOL! Thanks about the pics! New lens, shooting in RAW, but still not the new camera. Hopefully soon on that! I am getting better! I did it to myself again by coming here before breakfast. AND THEN you go and make some insanely delish and gorgeous that has crepes which, technically, are a breakfast food. SO, I could actually justify this over my oatmeal…but, it’s not on my plate. Wah. Haha! So sorry, Taylor! But yes, crepes are technically breakfast food!! LOL! 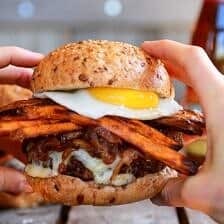 I think you should just make this for me. Holy gawd. I LOVE crepes cake. They are so delicate. My mom makes another similar cake called “decade” cake–technically because it has ten layers–but also because she makes it once every decade, haha. Thanks Laura! I bet you moms cake is awesome! 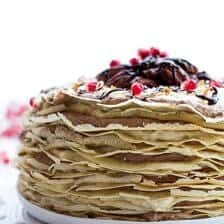 I’ve been wanting to make a crepe cake for ages but haven’t dedicated the time to it…I’m thinking you’re right, it’s so worth the effort! 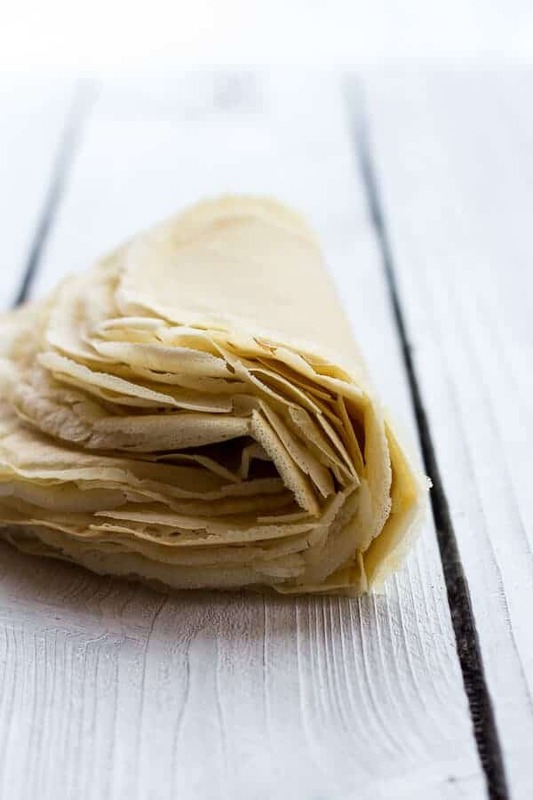 My family loves crepes and would go bonkers over this for Thanksgiving! Love that dedication you have for getting your photos to turn out perfectly! 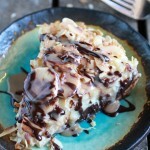 Not sure I’ve mentioned how much I adore coconut… I go crazy over anything that has it. And then add coconut rum and chocolate into the mix. Well, let’s just say this brought a big smile to my face. I still cannot believe there are people who do not like coconut. I mean, I personally LOVE it! So…I can totally have this for breakfast since crepes are like pancakes, right?! 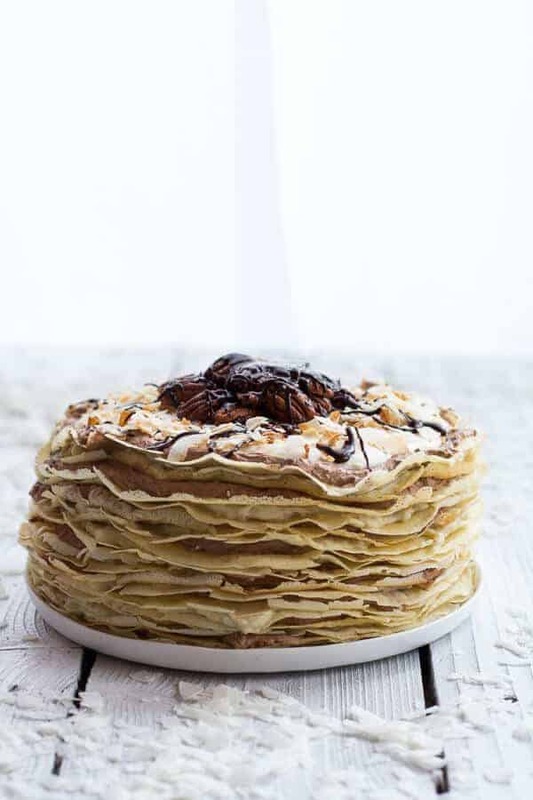 Crepe cakes are the perfect thing for a baby shower!! I really hope everyone loves it!! Thanks so much, Chelsea! Wow, Tieghan…this is one stunning cake!!! I’ve wanted to make a crepe cake for so long. I’m thinking this holiday season it’s time to hunker down and finally do it! No doubt it is 110% worth the time and effort. Yes, do it!! You will not regret is Kelli! Aaaaah. I am freaking out over here! What a gorgeous cake!! So amazing. Your crepes look fantastic, too! Not to mention completely gorgeous. I love how thin and crisp and white they are. ahhh in love. Thank you, Abbie!! How lucky are you that your mom is french and probably make the best crepes ever!! YUM! I may just make the coconut rum cream and eat it by the spoonful! You could totally do that! It is that good! I so adore coconut! Looks fabulous, girl! I think that’s the most gorgeous crepe cake I’ve ever seen!! Yup, it is! Tieghan, I want to be your best friend so I can come over to your house and you can make this cake for me haha (I promise I’m not trying to sound creepy). I want to eat it quite badly, but knowing me and my lack of ability (and patience) to follow long lists of directions, I’m afraid of what might happen XD. Haha! Not creepy,just super nice! Thanks so much, Rebecca! Oh and just give the crepes a try. Even if they tare you are still going to want to eat them! I totally need to make my own! 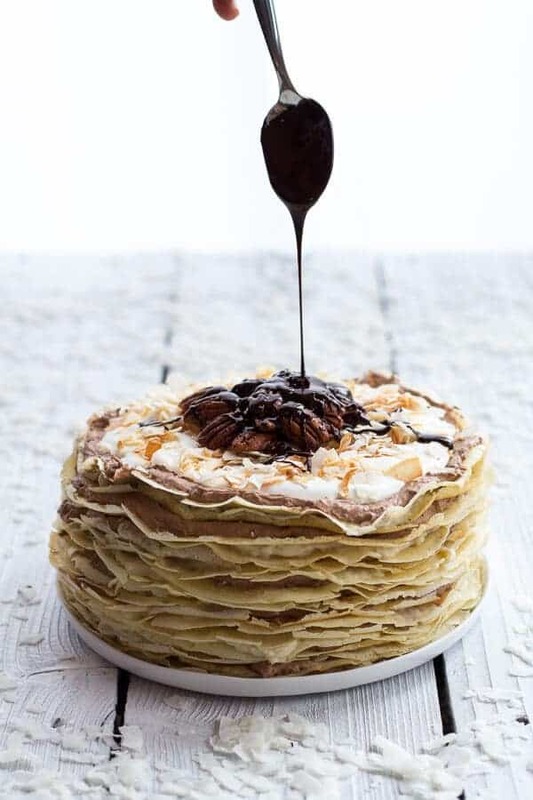 A crepe cake has been on my “to-make” list all year – this is simply stunning and your chocolate mousse sounds like heaven! Thank you, Laura! You have to make one. I know yours will be amazing! This cake looks insaaaaaane! I can definitely see why you’re excited about. I need more crepes in my life!! This is just beautiful! Those layers… I’m in love. This looks hard to slice and serve… is it? If not, my gosh does this look SPECTACULAR and YUMMY!!! Hey Angie! I was very surprised all three time how easy this was to slice and serve. You just have to make thin layers and make sure the is cold and it should cut beautifully!! Can I just say how pretty this is?! 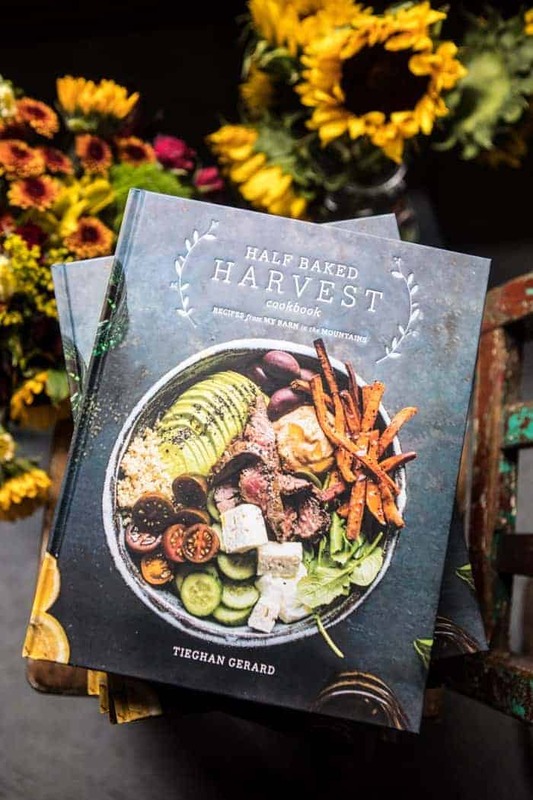 Beautiful job, Tieghan! And I adore the flavors. This is beyond beautiful! 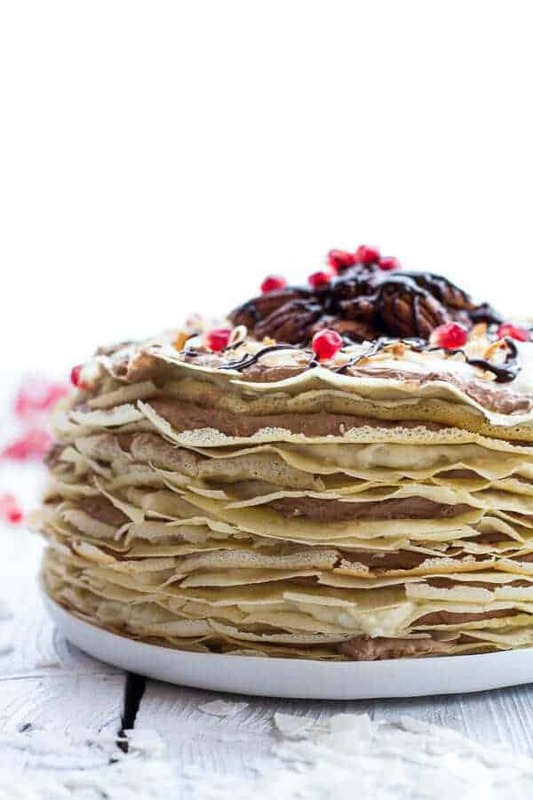 I’ve always wanted to make a crepe cake, but I don’t think I have the patience. Thank you so much, Kelsey! I hope you try it! GORGEOUS!!! I want it nooooow. 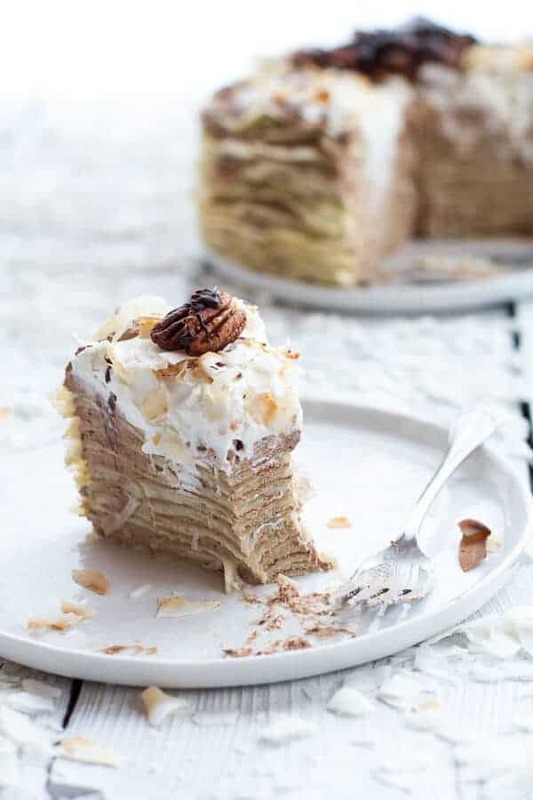 I love crepes so much and I have no doubt that this cake would be one of my all time favorites too. SO BEAUTIFUL! 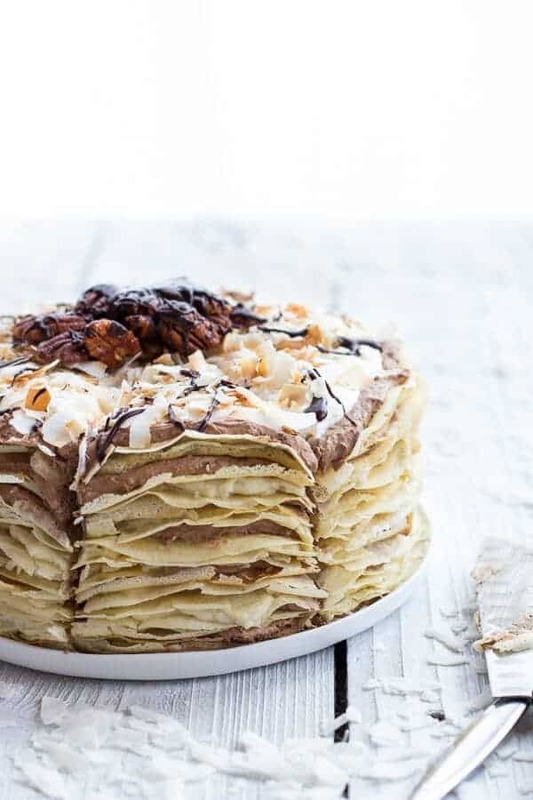 I have been dying to try a crepe cake and this looks spectacular! 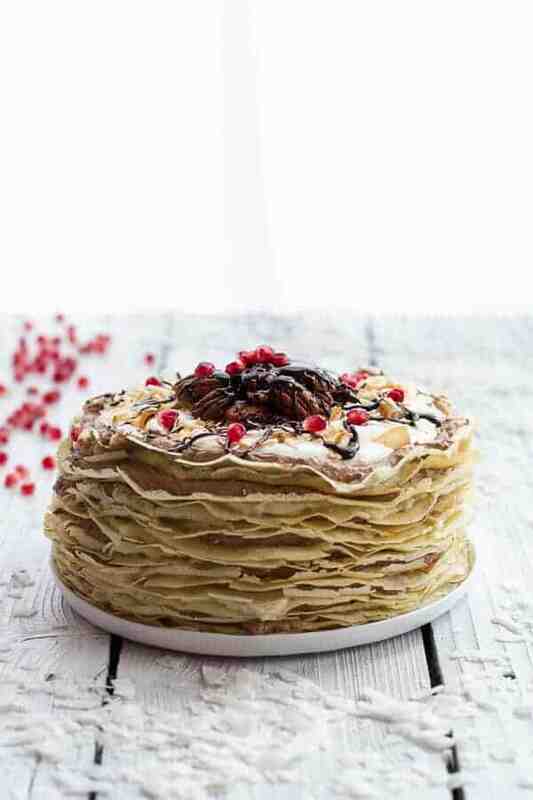 Wow, this crepe cake is an absolute stunner! The detail in your photos is incredible. What a showstopper! Ohhhhhh my this is like a napoleon, like a crepey napoleon that I must eat now!!! How do you think of such stuff?!?!? It must’ve took long- but probably worth it!!! Haha! 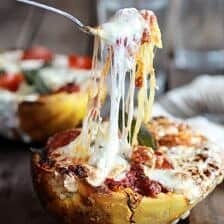 This recipe actually took months to completely come together! LOL! Thanks Liz! This is amazing. I definitely want to try making it.What size is the can of coconut milk? I made this over the course of the past two days and finished it tonight.. it was so so good. Now I need to just invite my friends over so they can help me eat it because it’s so big! SO happy you love this cake, THNAK YOU! A few days in the fridge will be fine, but I would not go longer than six days. Have a happy New Year! any chance you could say how big the cans of coconut milk you used were? Where I live they come i. 2 or more sizes, and it would be helpful. HI! I like to use 14 ounce cans of coconut milk. Please let me know if you have other questions, thanks! I made this over two days as you recomend and cut into it tonight. It is DELICIOUS!!!!! I couldn’t resist eating some of the chocolate mousse with a spoon, so I shorted my cake a couple of layers. 😉 This recipe takes time but it is not difficult. Instructions are easy to follow. Results are extremely tasty!! I’d love to see the instructions for the candied pecans included.